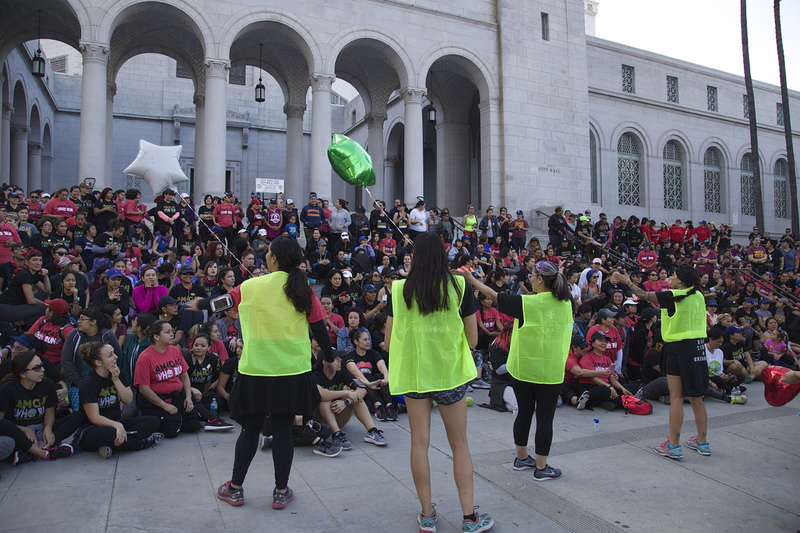 Hundreds of Amigas Who Run participants gather at Mariachi Plaza for the event kick-off. Sahra Sulaiman/Streetsblog L.A.
Boyle Heights, Long Beach, Hawthorne, Downey, Norwalk, Pasadena, Whittier, San Gabriel, Alhambra, Bell Gardens, Compton, Montebello, mid-city, West Covina, Pico Rivera, Pomona, South Gate, Huntington Park, Highland Park – you name it and one of hundreds of women and women-identified people who showed up to participate in the 3rd Annual Amigas Who Run 5-K event Sunday probably came from there. No matter where they hailed from, however, they all cited female friendship and the opportunity to be active with other women of color as the top reasons for their participation. 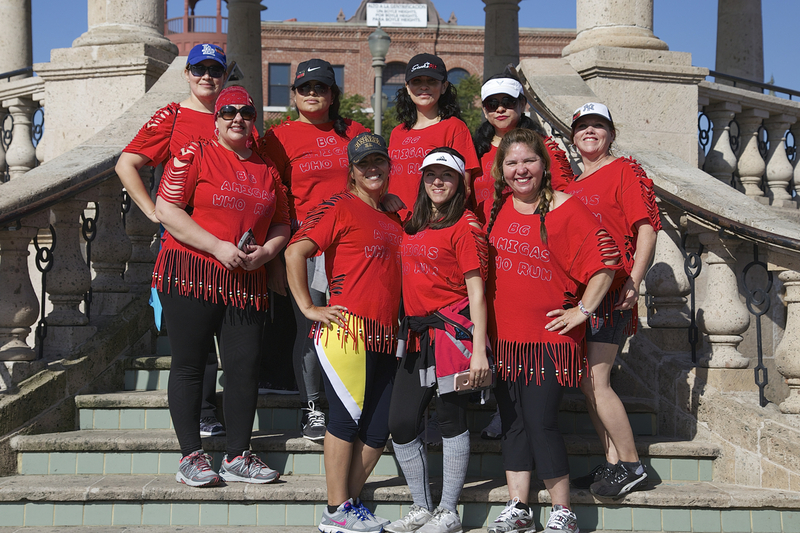 Most of the Bell Gardens Amigas Who Run have been friends since middle or high school – some have known each other 30 years. Sahra Sulaiman/Streetsblog L.A.
Having known each other since middle and high school (with one exception), getting together regularly to work out is a fun excuse to spend time together. And, as many other women I spoke to also said, the social nature of their work-outs were opportunities to bond and lend each other support in various aspects of their lives. Participating in an event that brought together so many other like-minded women of color to reclaim and assert their presence the streets – especially at a moment when women, folks of color, and immigrants are feeling under siege – felt empowering, they said. Women sporting colorful calaveras on their t-shirts agreed. These women hailed from Downey, Norwalk, San Gabriel, Whittier (some by way of Colima and el Distrito Federal). Sahra Sulaiman/Streetsblog L.A. They had eased their way into exercise through Zumba about four years ago and eventually worked their way up to running with the help of their boisterous Zumba teacher. And possibly also tacos, joked one woman. Exercising together was a way to have fun and, for some in the group, a way to stay young. Their sleeves were emblazoned with “Alex’s 60th” in celebration of Alex Torres’ birthday and they had brought Torres’ 90-year-old mother (in the wheelchair) along to enjoy the festivities. Las Chingonas came together officially in 2013, but their friendships date back a decade or more. Sahra Sulaiman/Streetsblog L.A.
Las Chingonas were also celebrating friendship, sisterhood, and family. They came together officially back in 2013 to motivate each other to be stronger, but had been friends long before that. 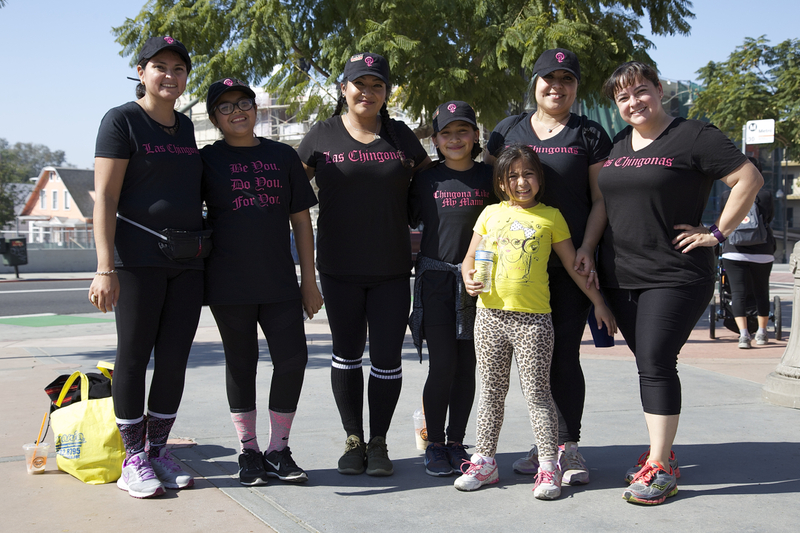 The Amigas Who Run event was an opportunity for them to amplify the empowerment they felt from coming together in their own group, empower their daughters, and take inspiration from the other participants – especially those that were moms like themselves. But they hoped to push others to push themselves, too, said Lorraine Lopez (center, above). Lopez had recently got into cross-fit, she said, and she enjoyed challenging others to join her in the fun, while occasionally indulging in some motivational trash talking. “We’re into motivating women as badass as us!” she laughed. Organizers and volunteers corral the runners for a group photo at City Hall – the half-way point. Organizer Lizzette Perez is at far right, Roxana Dueñas is just to her left. Sahra Sulaiman/Streetsblog L.A. The participants’ reasons for attending the Amigas Who Run event mirrored the organizers’ motivations for launching it. 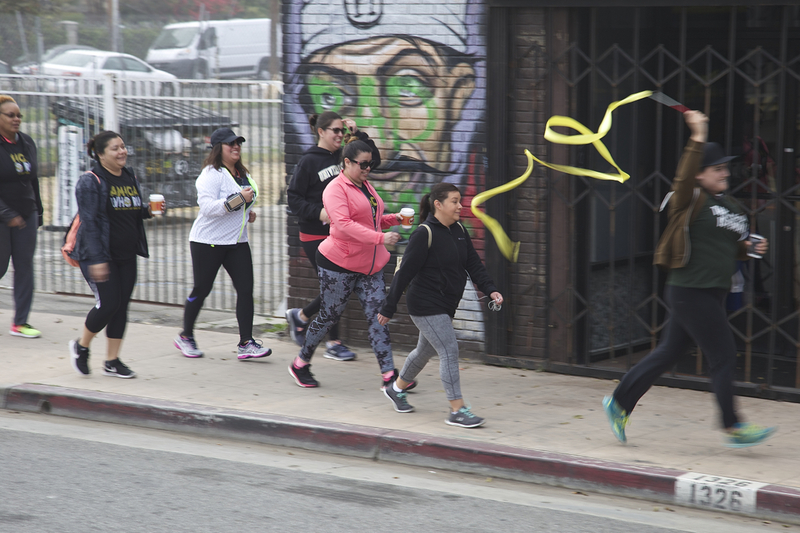 “All of us had been running for some time,” says Roxana Dueñas, an ethnic studies teacher at Roosevelt High School, sometimes running with different groups around the city, and more regularly with the Boyle Heights Bridge Runners. But their weekend meet-ups to run with each other were different, she continued – it was more social, more about comadre*-ness (*akin to a sort of sisterhood), where runs might include stops midway through for coffee and hang-outs afterwards. They may have all started running for different reasons – to feel strong, to practice self-care, as a coping mechanism for trauma, as a stress reliever, to motivate their students, etc. – but in coming together as a group, co-founders Dueñas, Emily Grijalva, Lizzette Perez, Elisa Garcia, and Myra Teocintli saw the opportunity to build community. In doing so, they managed to create an environment where they felt they could bring their whole selves to the table. 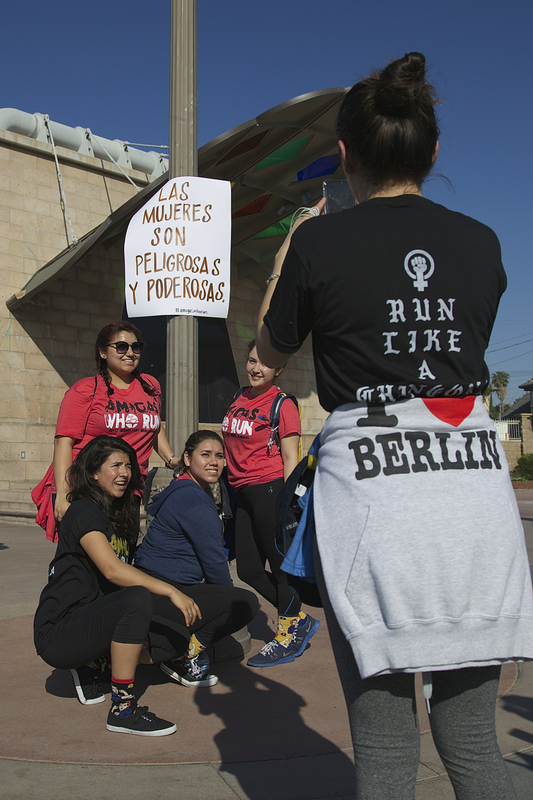 In other running groups around the city, they might be the only Latina, or the only one with their political perspective and identity. Running as a group, and also with the larger co-ed Boyle Heights Bridge Runners, they were able to connect with folks who understood intrinsically who they were as people, as well as what it meant to be rooted in a community like Boyle Heights – a working-class majority-Latino community that has long labored to transcend disenfranchisement only to see their way of life, identity, and culture threatened with erasure. Boyle Heights, as those that have followed our coverage know, is one of several renter-dominated formerly red-lined communities where lower-income residents of color now find themselves vulnerable to displacement [see more on that history here]. Moreover, it is a community where decades of disinvestment, discrimination, denial of opportunity and resources, and repressive policing combined to create an insecure and often inaccessible public space – forcing residents to build community in private spaces. Although many of these issues remain unresolved, residents themselves have played an integral role in helping to make their streets more accessible in recent years, often in spite of the lack of assistance from the city or law enforcement. And organized groups like the Bridge Runners and the Ovarian Psycos have used their activation of the Boyle Heights’ streets to raise the visibility of people of color and the contributions they make to the vibrancy of the community, help call attention to the amenities the community has been denied, and reinforce their claims to the area. But the flip side of their success in doing so, many fear, is that they have made their community that much more attractive to developers and outsiders. The arrival of fine art galleries and increasingly rapid shifts in the socio-economic landscape of the area only serve to confirm these fears and leave many concerned about their ability to remain in the area. So do threats of deportation from the new administration and unscrupulous landlords looking to get tenants to leave “voluntarily” so they can bring in higher-paying clientele. 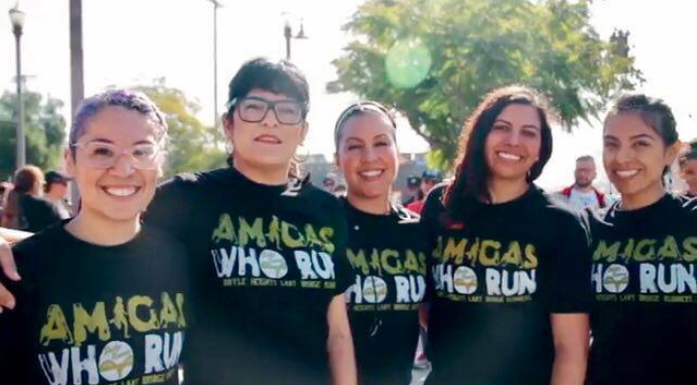 Reasserting their presence in the streets via a massively well-attended event like Amigas Who Run is a way to reclaim – as people of color and as women – some control over how they and their community are defined and a voice in determining the future trajectory for both. 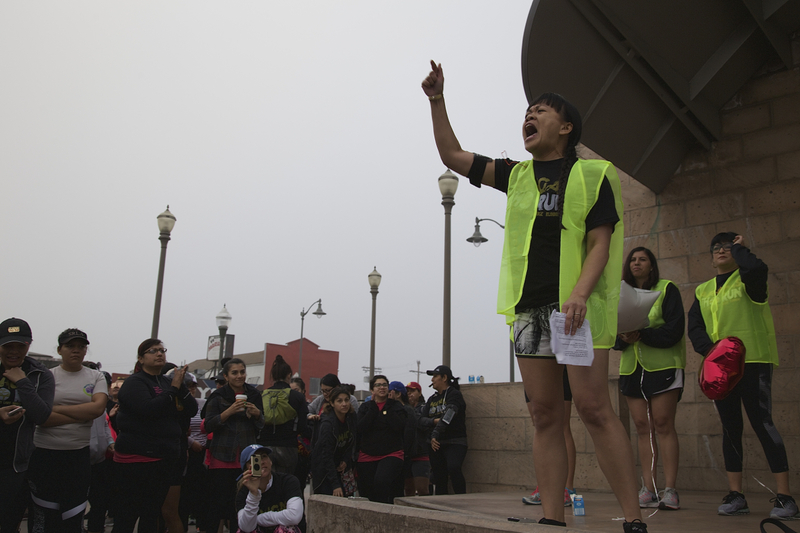 Jollene Levid of AF3IRM, a transnational feminist organization, speaks about surviving domestic violence, how running saved her, and the power of united women of color taking to the streets. Sahra Sulaiman/Streetsblog L.A.
That work has special meaning for co-founder Myra Teocintli, a licensed childcare provider whose practice nurtures children from 14 area families and who is part owner of Espacio 1839, a collective art space that has become a central hub for the celebration of the resilience of Boyle Heights’ community and culture. Just this past Friday, she curated Eres Poderosa, vol. 2 (You [Women] Are Powerful) at Espacio, a show and spoken word event highlighting the work of local women/women-identified artists in showcasing feminine strength around the world. Like the Amigas Who Run event, the show was meant to tie into International Women’s Day and Women’s History Month. The link is important, Teocintli suggests, to acknowledge that, “women of color have [always] been under attack and marginalized.” It’s why she conceived of the first Amigas Who Run event three years ago. She had wanted to “create a grassroots safe space, free from the trauma [imposed] by a patriarchal society” that valued and classified women by body image and dictated what women could and could not do. The renewed assaults on women’s reproductive health, mental health, and access to health, in general, she says, only serve to underscore why “sisterhood is crucial” at this moment. Running as one, she believes, can help women of color reclaim physical, cultural, and social space in the streets together, stake out a platform from which they are more powerful and more able to shine together, and heal themselves as they celebrate each other. It had proven true in her own experience, and she was convinced that others would benefit in the same way. So, Teocintli and the other organizers created a logo, printed up some shirts and some stickers, and put the word out. The event was free, meant to be non-competitive/fun, and intentionally unsanctioned, they advised. Keeping it free of sponsors and the responsibilities (and law enforcement presence) that come with street closures, they felt, would keep it grounded in the spirit of community-building and communal self-care. Inspirational messages posted up along the route to City Hall from Mariachi Plaza would remind participants of the intention of the event and of participants’ value to their community. Las mujeres son poderosas y peligrosas/Women are dangerous and powerful. Sahra Sulaiman/Streetsblog L.A.
Enticing a vision as it was when Teocintli first came up with it, however, none of the co-organizers seemed to have anticipated just how much these ideas would resonate with other women. They only expected about 30 women to show up to that first event, Dueñas and Grijalva say, and were stunned when nearly 200 people packed Espacio 1839 and Mariachi Plaza, eager to participate. Word of how empowering the event was spread quickly. The following year, around 700 women showed up. This year’s tally might not have reached 700, but it was still pretty impressive. 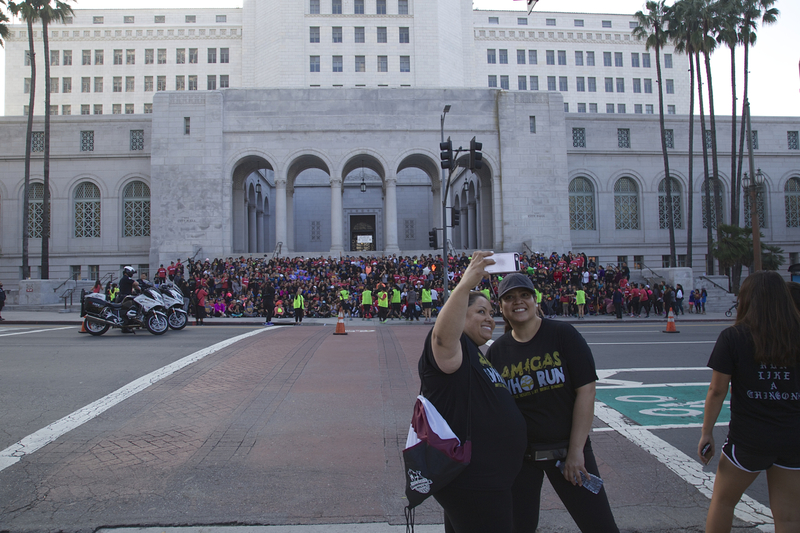 Runners take a selfie as the group assembles on the steps of City Hall for a photo. Sahra Sulaiman/Streetsblog L.A. Even as it grows, the event intentionally remains very DIY, says Dueñas. They had to adjust their approach slightly because of the size of event – getting port-a-potties put outside Espacio 1839 and accepting help from the L.A. Derby Dolls to manage safety at intersections. The organizers also fundraise a little by selling support t-shirts, but they tend to give away more than they get. They printed up hundreds of shirts this year, made special commemorative pins for participants, gave away swag at a raffle just before the run began, and with support from the larger Bridge Runners group, had water and snacks on hand for all who needed them. But the event is otherwise not that different from a gathering of friends for a fun run on a really large scale. And as always, it remains focused on women empowering other women and women-identified folks. 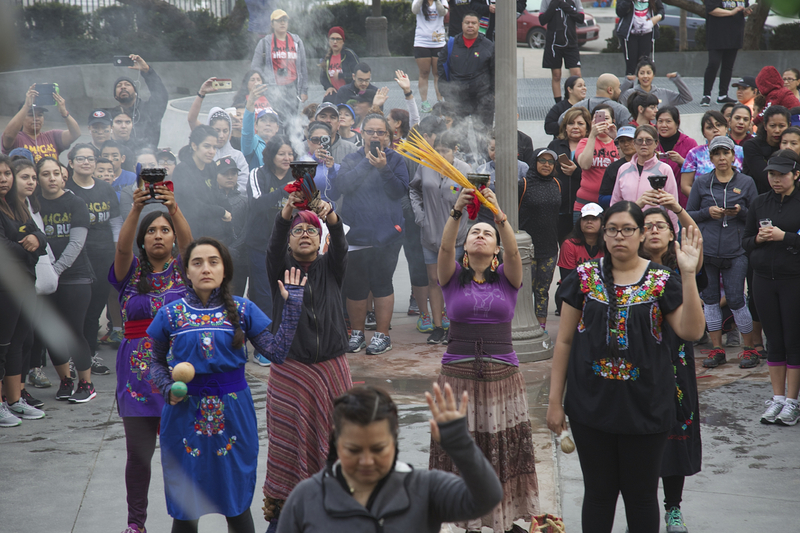 Women blessing women before the run with a Xinachtli performance. Xinachtli, an Aztec/Nahuatl word, refers to the moment a seed begins to germinate. Sahra Sulaiman/Streetsblog L.A. It was heart-breaking to see her female students become cognizant of how much their bodies were under scrutiny, says Grijalva, and to watch them try to alter their appearances to avoid attracting unwanted gazes. For her part, Dueñas remembers exercise being taught to her and other girls as a way to make them more appealing to men, with girls being told to imagine “fat melting off [our] bod[ies]” during physical education classes. For these and other reasons, they continue to restrict the run to women and women-identified people – to create a space for self-determination, where women feel free to be themselves independent of how men or anyone else wishes them to be. It’s a simple but intentional stance that continues to be surprisingly controversial and revolutionary, Dueñas muses. Which makes the organizers feel it is all the more important that they continue to adhere to it, regardless of how much men (and occasionally some of the female participants) complain. In the end, if there were any doubts about the value of a women-centered event, I didn’t hear them. Every single person I met before, during, and after the run spoke only of how empowering it was to see so many women like themselves taking to the streets. Keep up with #AmigasWhoRun here, see my album of photos from the run here, and find the FB event page, here. I’m a fan and follower of your work, and I’d like to make a suggestion in good faith: that the phrase “women and women-identified” does damage when it intends to do good. While I assume the intent of the phrase is to be inclusive of non-cis women by naming and celebrating their presence, its effect is to separate, and create a hierarchy of, “real” women and those who merely “identify” as women. To be clear, and to the extent that it matters, I don’t necessarily suggest that you feel this way about non-cis women, just that you risk (and in my opinion, do end up) sounding this way. If you want to point out that both cis and trans women were present—whether to indicate a queer-and-trans-friendly space, or to specifically celebrate the actions of trans women—I would propose “women, both cis and trans,” or “cis and trans women,” etc. Thanks for your thoughtful thoughts. I also thought about that while writing but decided to use the language that the group used in their event promotion. 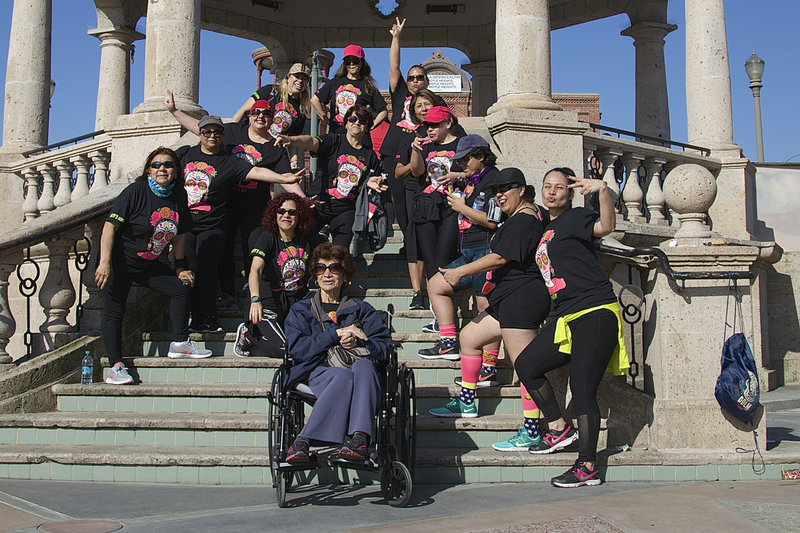 Both Amigas Who Run and the Ovarian Psycos have used “women-identified” – not as a way to define other women but as a way to intentionally signal they wanted all female spirits to feel welcome and were consciously making the effort to make space for all. It was also a way to let men know that they were welcome to participate in supporting the event, but not running in the event itself. The women who run those groups are actively involved in women’s issues, very intentional in the way they approach those issues, and it’s language they have used for a while – so it was used here. That said, I don’t disagree with you. I know that the groups believe all female spirits are women, as do I. I also feel the language is deeply imperfect… I can think of at least two people I personally know of that are excluded by the “women, both cis and trans” label. In their cases, female-identified is more accurate to how they see themselves and is actually language i have heard them use to describe their own identities. The moment we start to put labels on things is the moment we begin to exclude, or indicate difference (women v. non-cis women, for ex. ), no matter how good our intentions. And yet, not acknowledging difference can silence and uphold dominant images defining particular categories. I myself am still trying to figure out how to navigate the best way forward to speak to inclusiveness without inadvertently implying less-than-ness. I’m not sure I always get there.